Our RC Logger RC Eye One Xtreme Phoenix Flight Gear Aluminum Motor Mount set is CNC machined from billet aluminum making it very strong and keeping it light. They are designed to work with the Phoenix Flight Gear Carbon Fiber frames for the Eye One Xtreme. 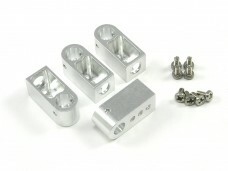 The unique design of this aluminum mount securely holds the motor in place with 2 set screws. They also work as a heat sink keeping your motors running cooler for longer life and better performance These mounts will give the confidence needed for worry free flying on these great carbon fiber frames. Install motor mount onto carbon fiber frame with the Phoenix Flight Gear supplied screws and locknuts. When installing the motor into the mount, tighten the 2 set screws so the motor does not spin or pull out. Not a lot of pressure will be needed for this. Do not over tighten screws. Adding a drop of loctite to the threads will ensure the screws will stay in place. Always check mounting screws before each flight to ensure nothing has come loose from vibrations.